Step 1 In a large bowl, combine the lamb, back fat, salt, sugar, pepper flakes, garlic, roasted pepper, black pepper, paprika and oregano and toss to evenly distribute the seasonings. Cover and chill until ready to grind. Step 2 Grind the mixture through a meat grinder fitted with the finest plate into a large bowl set over an ice bath. Step 3Add the wine and water to the meat mixture and mix in a stand mixer using a paddle attachment, or by hand with a sturdy spoon, until the liquids are incorporated and the mixture has developed a uniform, sticky appearance, about 1 minute on medium speed. Step 4Fry a small patty until done to check the flavor and seasoning (the sausage should be cooked to an internal temperature of 150 degrees). If necessary, adjust salt, pepper and other seasonings, then fry another patty and check again. Step 5Stuff the sausage into the sheep casings with a sausage stuffer and twist into 10-inch links. Refrigerate up to 2 days or freeze up to 2 months until ready to cook. In Recipes-list.com we have selected the most viewed recipes from category - Appetizers Main courses . Enjoy the best recipes specially selected for you! 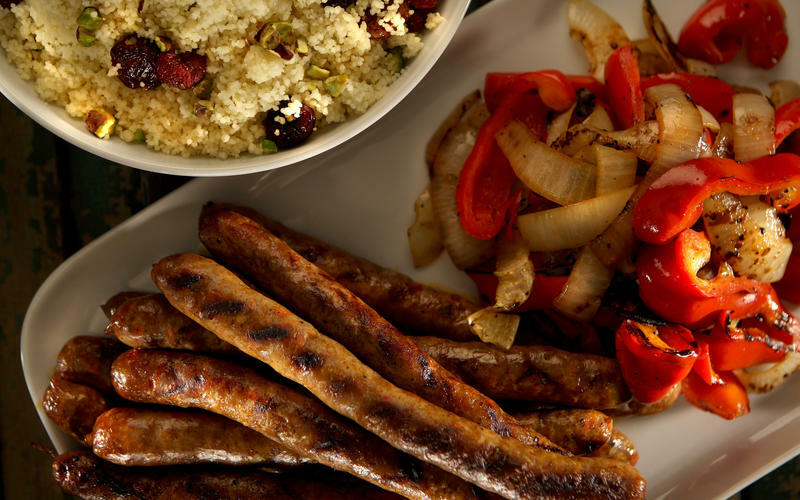 Merguez is the right choice that will satisfy all your claims.